Beautiful Thai-style villa, set in a lush tropical garden, ten minutes walk from a long, peaceful sandy beach. Very idyllic, private swimming pool. Fully-serviced. Guarded security entrance. 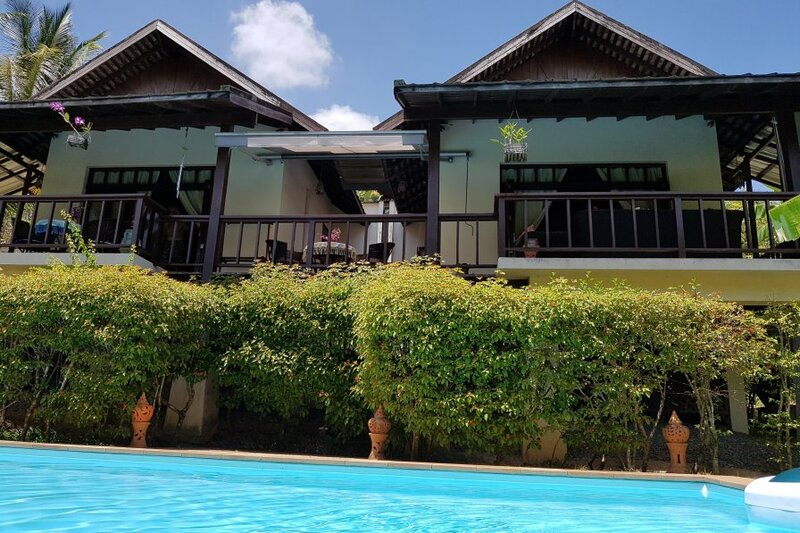 The villa is located in the north of the island, a 10 minutes walk from a long, peaceful, palm-surrounded sandy beach dotted with cosy restaurants serving delicious food with gracious Thai hospitality. It is a romantic hide-away, very secluded and private with its own private swimming pool. It is very idyllic, surrounded by tropical plants which are flowering almost the whole year. A surprisingly cooling breeze coming from the ocean will make it possible to spend most of your time on the terrace or in the pool area. You will enjoy living in the privacy of your fully -serviced and gated Villa inside the village of Santi Thani. We provide house cleaning twice per week, as well as towels and bed linen change. Airport transfer, car & motorbike rental, laundry, breakfast delivery, private Thai cook, Island excursion, private massage. On one part of the villa is located a king-size master bedroom with an ensuite bathroom and an air conditioned wardrobe which can be used as a spare single bedroom or as a luggage storage. This room has washing machine and a large fridge. Large foldaway glass doors open onto a big furnished terrace, optimizing indoor-outdoor living. On the other part is located an air conditioned dining/living room area, a fully equipped built –in European standard kitchen, an air conditioned twin bedroom with ensuite bathroom. The living room is equipped with pixel technology TV, cinema surround, dvd and vcd stereo player. Also here the large foldaway glass door open onto the dining area on the terrace. The kitchen is equipped with an electric cooker, electric oven, microwave oven, water heater, blender, toaster, large refrigerator with deep freeze. The terraces are roofed and covered with tiles. There are ceiling fans, sun beds as well as a comfortable sitting to provide cosiness in the shade. The garden at night is enlighten by Chang Mai style lamps which create a very warm and romantic atmosphere. Villa Samadhi is situated on the lower part of the private gated hillside village of Santi Thani. Santi Thani is a 20 minutes journey from the airport and is located on the quietest north cost of Kho Samui. The beautiful beach is only a 5 minutes walk from the villa through the landscaped gardens of Santi Thani. There are several bars and restaurants dotted along the beach. This part of the coast boast some spectacular sunsets at various times of the year. There is local shop situated at the entrance which will provide guests with day to day necessities. For a fuller shop there is a Tesco Lotus superstore and a BIC C on the island. Around the island to the west is the island’s main town of Nathon, a 15 minute drive by car or local bus. This is a great place for souvenirs hunting and there are also several supermarkets. To the east are the villages of Maenam and Bophut, which are about a 10-15 drive where arrangements can be made for sightseeing, boat trips, fishing trips, diving, snorkling and many other activities. Maenam has several restaurants and is home to the islands early morning market. All rooms are airconditioned. The master king size bedroom, the twin bedroom, the wardrobe which can be used as a spare bedroom and the living room, but most of the time the celing fans are enough to keep the house cool. The house is very secluded and private with its own 7 x 4 m. swimming pool and it is securety guarded day and night. We provide house cleaning twice per week, towels and bed linen. Extra service on request: Airport transfer, car & motorbike rental, laundry, daily maid service, breakfast delivery, private thai cook, Island excursion, private massage. .